Sugar has a bad reputation, but is its reputation deserved? In small amounts, sugar is probably fine. The problem is that most Americans eat more sugar than they should. Too much sugar can cause tooth decay or lead to weight gain and illness. Today, the average American eats 150 to 170 pounds of sugar each year. During George Washington’s time, most people ate less than 6 pounds of sugar annually. Sugar is a carbohydrate found in plants, including fruits and vegetables. Through the process of photosynthesis, plants make sucrose, a natural sugar. Some sugar in our diets is necessary for healthy brain development and energy. Sugar is most concentrated in two plants: sugar cane and sugar beets. White granulated sugar is made by extracting the sucrose from these two plants. Brown sugar is white sugar mixed with molasses. In England, people use Demerara sugar, a light-brown sugar; and Muscovado sugar, a dark-brown sugar. Powdered sugar is ground sugar mixed with a small amount of cornstarch. We tend to think of sugar as an ingredient in candy and cookies, but sugar is also found in cereal, bread, ketchup, and many other products. To stay healthy, most people don’t have to give up sugar entirely. Instead, eat a varied diet including lots of fruits and vegetables, whole grains, dairy products, and protein, such as chicken. Think of candy and desserts as a “once in a while” food. Farmers in Idaho, Montana, Wyoming, Oregon, Washington, Colorado, and a few other states with cooler climates grow sugar beets. Nearby factories process the sugar beets and turn them into sugar. Sugar cane grows in warm climates, such as Texas, Florida, and Louisiana. Question: What foods should I limit? Answer: Obviously, foods like candy and cookies contain sugar, but sugary drinks are one of the biggest problems for kids. Limit or avoid drinking soda, sugary drinks, and even fruit juices. Here’s a good guideline: drink a small glass of fruit juice for breakfast, milk for lunch and dinner, and water the rest of the day. 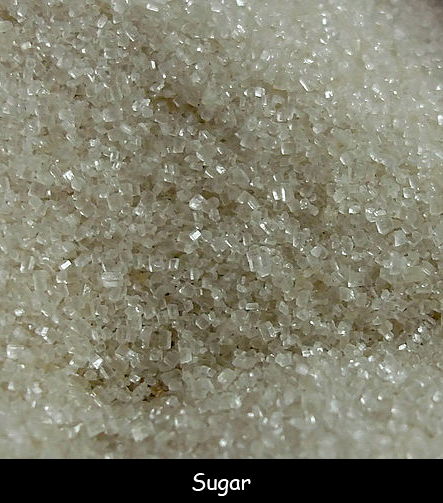 Find lesson plans and publications about sugar. Visit a sugar beet farm in Montana. Declan, Tobin. " Sugar Facts for Kids ." Easy Science for Kids, Apr 2019. Web. 26 Apr 2019. < https://easyscienceforkids.com/sugar/ >.